Sturdy materials well put together make the Tundra Tarp perfect for applications where lighter materials might be a liability. Custom made in two weights (1.1 oz and 1.9 oz) and a variety of shapes, sizes, and colors Cooke gives you a lot of options to fit your needs. The numerous tie out loops and flat shape let you get really creative in your setup with lots of options at your disposal. Cooke Custom Sewing is a small family business well known in the paddling community for their shelters, packbags, and other custom made gear. Prior to placing my order I exchanged emails directly with Dan and service was quite prompt. You may need to open the full sized version of this pic to see the details, but it is a great place to start looking at what this tarp is made out of and how it is put together. The material here is listed by Cooke as a 1.9oz silicone coated nylon and they also have a lighter, 1.0oz silnylon material available. On the left you can see the coated interior side of the material while the right side shows the exterior. If you've enlarged the picture you'll also be able to easily see the stitching is very well done. Note the area where the tie out loop is sewn in and how the stitches remain even throughout. Given the heavy materials and strong construction one would expect durability. 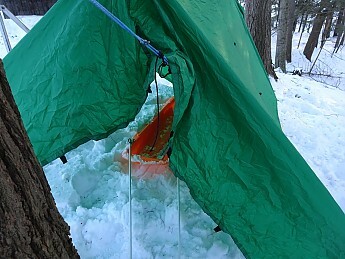 The Tundra Tarp is made to take abuse at the expense of weight. Exposed to family trips and winter conditions, though not both at once heh, it shows no signs of use at all. Even spending long periods of time crammed into its stuff sack don't seem to have bothered it and the material remains smooth and uncreased. If you are used to modern, ultra light tarps you will definitely notice that the 1.9oz Tundra Tarp packs large in comparison. 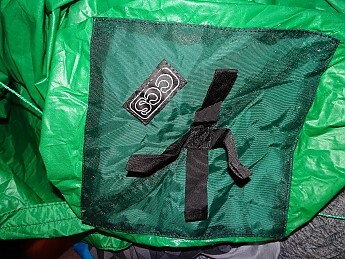 The black bag contains a Hammock Gear silpoly 10x12 tarp while the green bag contains the Tundra Tarp, though to be fair that bag also contains six tie outs, but Cooke made the stuff sack this big because the tarp needs it. Rough packed dimensions are 15" tall with a 5.5" diameter as shown with tie outs in there. 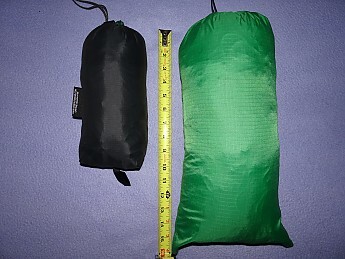 There also is a pretty big weight difference between these two tarps. 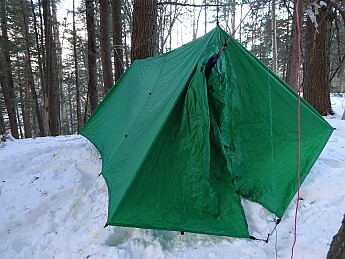 Keeping in mind that the Tundra Tarp is 2' longer, the HG weighs 22.5oz in the bag compared to the listed weight of 42oz for this version of the tarp on the Cooke site. A previous pic looked at one of the tie out loops from an edge. This shot shows the larger center loop which can accommodate a pole or other anchor bigger than a line. All loops are made of the same 3/4" nylon tape sewn around the edges and are double stitched into the seams. Here is the view from the inside where you can see the section of pack cloth sewn where the four tarp panels are joined together. The four loops in the center are for attaching a center pole or a paddle. The seam sealing job is my own so don't hold Cooke responsible for the quality of that, but do note again how nice the stitching is. This tarp was not just slapped together. 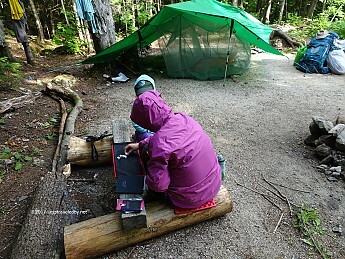 The Tundra Tarp was used during warmer months on family trips. It served as a front door on lean-tos and as a roof over our bug house. It has also been used as a hammock shelter for winter conditions. 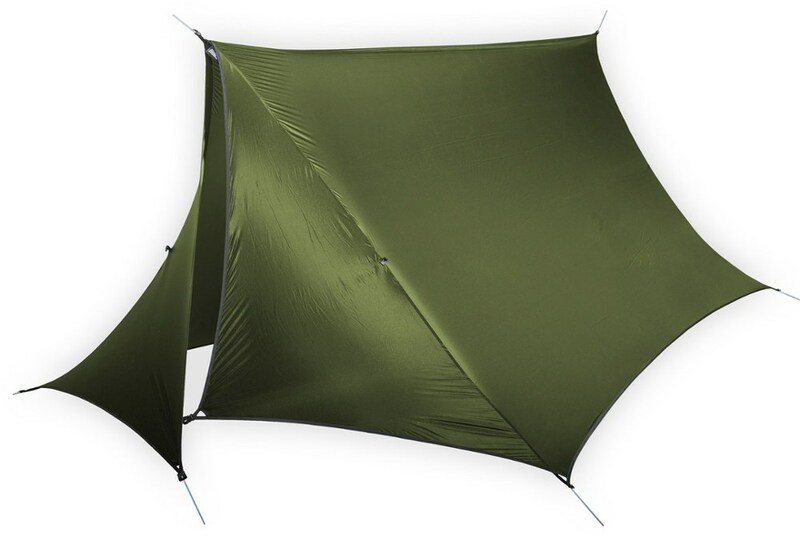 I came across the Cooke tarps while researching hammock options and while it wasn't what I was looking for, I bookmarked their site. 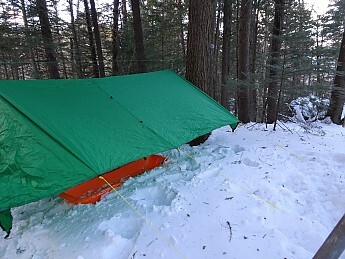 Later, when I purchased the bug house (Exped Travel Box II Plus) I took another look at their Tundra Tarps and decided that it would either make a sturdy option for family use or a functional winter shelter for my hammock. Turns out that it does both very well so I have been pretty pleased with the purchase. We enjoyed it as an easy bit of added shelter when wind or rain threatened the open side of an LT. With so many tie outs around the edges it was easy to hang from available points or from a line strung across the front. Here I have hiking poles attached weighing down the bottom. Flipped upside down I could use the ridge and centerline tie out loops to attach the bug house to the roof. We are set up low for a storm in this shot, but this worked really well when we set up at full stand up height. 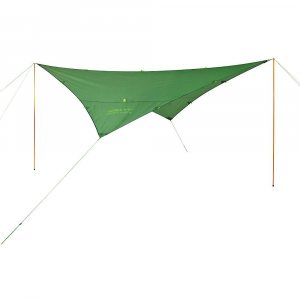 With so many tie outs this flat tarp can be shaped to fit varying sites and conditions. 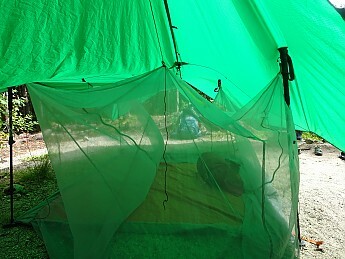 Here in winter hammock mode I've moved the corner down two tabs on the side that will take the wind, leaving me plenty of material to close the door. On the other side there remains enough material to cover most of the open area if needed. This makes for a pretty well protected hang, especially if the sides are down close to the snow. The negative aspects, weight, and size need to be acknowledged, but they are what this product is about so I did not reduce the score for that reason. I took a star off because there was a pretty sizable defect in one of the tarp panels. Despite many attempts I can't get a usable picture of the flaw, but it was enough to make me worried it might be more than cosmetic. After testing it seems to hold water and hasn't split open in the wind so it may well just be a visual problem. Still, given the hand crafted nature of the product, I would have expected that to be sold as a second rather than at full price which accounts for half a star and the other half just for making me worry. That aside I feel I have totally gotten my money's worth out of this purchase and expect to be using this tarp for years to come. Yes, it is heavy, but worth carrying in some situations. The flexibility of a flat tarp can be overlooked in the era of scientific cuts designed to win the tight tarp award at the next group hang. 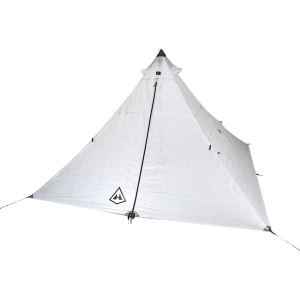 With lots of anchor points the Tundra Tarp can be a roof, floor, wall, door or just about any combination of them. If you are really creative it could do all at once as I've seen a person create a cube structure out of a flat tarp and then crawl inside heh. Bottom line is that if you need a UL tarp, buy one. If you need a heavy duty tarp to handle bad weather or rampaging children then something sturdy like the Tundra Tarp might be of use. Check out their line of sizes and weights. They have a few colors to choose from and include a stuff sack and 80' of line. I am not a paddler these days really, so can't speak to it from that perspective, but I have been very happy with this tarp on more than one occasion and can recommend Cooke Custom Sewing as being worth a look if you aren't familiar with them. Nice review, LS! Thanks for the recommendation of this company. Pretty cool simplicity. Thanks for the review. Another great review, LS! Thanks. 1.9oz IS heavy when backpacking but then again you get a sturdy waterproof tarp so..
@Nick That definitely is a trade off. 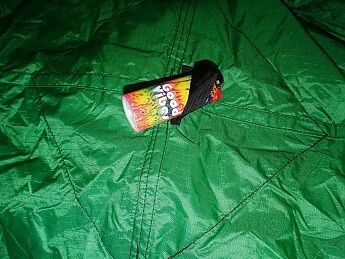 When I want to go light this tarp stays home, but when I need to be bombproof it is worth the weight. Love these reviews you’ve been firing off of some lesser known companies Lone. IMO people get far too carried away by the weight of some gear now a days. Durability (especially with gear you’ll use with your family) is priority number one! 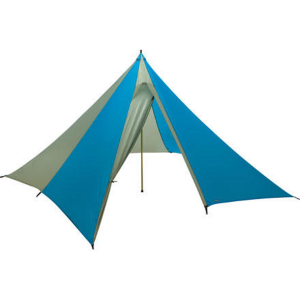 @Jake Thanks, I'm always looking for new options to try :) Going with this large, heavy tarp is what allowed me to take a chance on leaving the 7.5lb family tent at home even on trips without a lean to. I actually saved weight, but still feel pretty protected, so long as we have a site with good drainage. 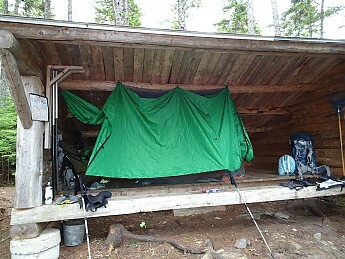 Sleeping alone under a UL tarp works for me, but with the family I sleep better under something more sturdy. Nice review. 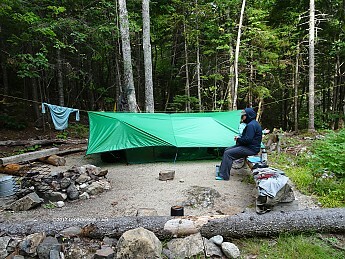 I have this same tarp, as well as nearly one of everything Dan Cooke makes, and I think the tarp is great. You can certainly find lighter options on the market if weight is the main concern. 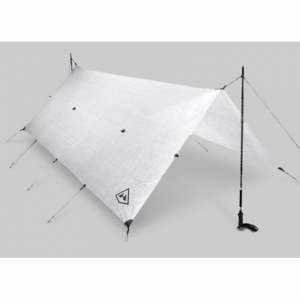 Few other tarps have the multitude of tie out points as well as the reinforced center pole support. 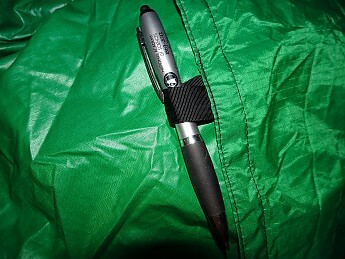 Since the tie out points are reinforced with webbing you will never have one pull in even the worst winds. All of Cooke's products are built to last. 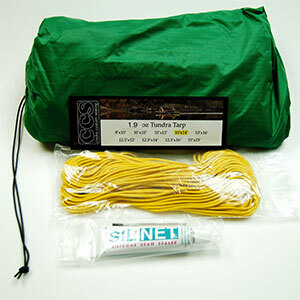 The Cooke Custom Sewing 1.9oz Silicone Tundra Tarp is not available from the stores we monitor.